50 Beers: A free pint. 100 Beers: A free Biggie Beer. 150 Beers: Choice of a Saucer Cap, T-shirt, or Frisbee. 200 Beers: Plate #1 - Your name on a plate in the Ring of Honor plus a $100 Toast for you and your friends. 400 Beers: Plate #2 - $100 Toast. 600 Beers: Plate #3 - "3PEAT" T-shirt plus $100 Toast. 800 Beers: Plate #4 - $125 Toast. 1000 Beers: Plate #5 - Saucer M.O.U. Card, "5iver" T-shirt plus $125 Toast. 1200 Beers: Plate #6 - $150 Toast. 1400 Beers: Plate #7 - $150 Toast. 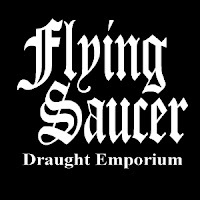 1600 Beers: Plate #8 - Custom Flying Saucer Stein plus $150 Toast. 1800 Beers: Plate #9 - $175 Toast. 2000 Beers: Plate #10 - Airfare & Tickets for 2 to the Great American Beer Festival. Presumably the Flying Saucer foots the bill for a new liver after earning the 11th plate. See the fine print on the website for rules and limitations for those who have already earned multiple plates as you may receive these new benefits retroactively. Since I'm still slowly working my way through my first 200 beers (only at 36), I don't really see earning more then one plate in this lifetime. 2000 beers @ $4.75/pint = $9500 for airfare and tix to GABF? I just see it as a bonus. If you're going to drink beer there anyway, at least you're getting something extra out of it. I wonder how many have got to 10 already? I wonder how fast I can drink 2000 beers.